This article is about the fruit. For the colour, see Orange (colour). For other meanings, see Orange (disambiguation). The orange is the fruit of the citrus species Citrus × sinensis in the family Rutaceae. It is also called sweet orange, to distinguish it from the related Citrus × aurantium, referred to as bitter orange. The sweet orange reproduces asexually (apomixis through nucellar embryony); varieties of sweet orange arise through mutations. ✪ tomato and orange, fruit or vegetable. All citrus trees belong to the single genus Citrus and remain almost entirely interfertile. This includes grapefruits, lemons, limes, oranges, and various other types and hybrids. As the interfertility of oranges and other citrus has produced numerous hybrids and cultivars, and bud mutations have also been selected, citrus taxonomy is fairly controversial, confusing or inconsistent. The fruit of any citrus tree is considered a hesperidium, a kind of modified berry; it is covered by a rind originated by a rugged thickening of the ovary wall. Different names have been given to the many varieties of the genus. Orange applies primarily to the sweet orange – Citrus sinensis (L.) Osbeck. The orange tree is an evergreen, flowering tree, with an average height of 9 to 10 m (30 to 33 ft), although some very old specimens can reach 15 m (49 ft). Its oval leaves, alternately arranged, are 4 to 10 cm (1.6 to 3.9 in) long and have crenulate margins. Sweet oranges grow in a range of different sizes, and shapes varying from spherical to oblong. Inside and attached to the rind is a porous white tissue, the white, bitter mesocarp or albedo (pith). 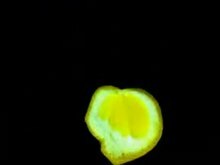 The orange contains a number of distinct carpels (segments) inside, typically about ten, each delimited by a membrane, and containing many juice-filled vesicles and usually a few seeds (pips). When unripe, the fruit is green. The grainy irregular rind of the ripe fruit can range from bright orange to yellow-orange, but frequently retains green patches or, under warm climate conditions, remains entirely green. Like all other citrus fruits, the sweet orange is non-climacteric. The Citrus sinensis group is subdivided into four classes with distinct characteristics: common oranges, blood or pigmented oranges, navel oranges, and acidless oranges. Mandarin orange (Citrus reticulata) is an original species of citrus, and is a progenitor of the common orange. Bitter orange (Citrus aurantium), also known as Seville orange, sour orange (especially when used as rootstock for a sweet orange tree), bigarade orange and marmalade orange. Like the sweet orange, it is a pomelo x mandarin hybrid, but arose from a distinct hybridization event. Bergamot orange (Citrus bergamia Risso), grown mainly in Italy for its peel, producing a primary essence for perfumes, also used to flavor Earl Grey tea. It is a hybrid of bitter orange x lemon. Trifoliate orange (Poncirus trifoliata), sometimes included in the genus (classified as Citrus trifoliata). It often serves as a rootstock for sweet orange trees and other Citrus cultivars. The word orange derives from the Sanskrit word for "orange tree" (नारङ्ग nāraṅga), which in turn derives from a Dravidian root word (from நரந்தம் narandam which refers to Bitter orange in Tamil). The Sanskrit word reached European languages through Persian نارنگ (nārang) and its Arabic derivative نارنج (nāranj). The word entered Late Middle English in the fourteenth century via Old French orenge (in the phrase pomme d'orenge). The French word, in turn, comes from Old Provençal auranja, based on Arabic nāranj. In several languages, the initial n present in earlier forms of the word dropped off because it may have been mistaken as part of an indefinite article ending in an n sound—in French, for example, une norenge may have been heard as une orenge. This linguistic change is called juncture loss. The color was named after the fruit, and the first recorded use of orange as a color name in English was in 1512. As Portuguese merchants were presumably the first to introduce the sweet orange to some regions of Europe, in several modern Indo-European languages the fruit has been named after them. Some examples are Albanian portokall, Bulgarian портокал (portokal), Greek πορτοκάλι (portokali), Macedonian portokal, Persian پرتقال (porteghal), Turkish portakal and Romanian portocală. Related names can be found in other languages, such as Arabic البرتقال (bourtouqal), Georgian ფორთოხალი (pʰortʰoxali) and Amharic birtukan. Also, in some of the Italian regional languages (e.g. Neapolitan), an orange is portogallo or purtuallo, literally "(the) Portuguese (one)", in contrast to the Italian arancia. In other Indo-European languages, the words for orange allude to the eastern origin of the fruit and can be translated literally as "apple from China". Some examples are German Apfelsine (alternative name for Orange and common in northern Germany), Dutch appelsien and sinaasappel, Swedish apelsin, Russian апельсин (apelsin) and Norwegian appelsin. A similar case is Puerto Rican Spanish china. Various Slavic languages use the variants pomaranč (Slovak), pomeranč (Czech), pomaranča (Slovene), and pomarańcza (Polish), all from Old French pomme d'orenge. The sweet orange is not a wild fruit, having arisen in domestication from a cross between a non-pure mandarin orange and a hybrid pomelo that had a substantial mandarin component. Since its chloroplast DNA is that of pomelo, it was likely the hybrid pomelo, perhaps a BC1 pomelo backcross, that was the maternal parent of the first orange. Based on genomic analysis, the relative proportions of the ancestral species in the sweet orange is approximately 42% pomelo and 58% mandarin. All varieties of the sweet orange descend from this original cross, differing only by mutations selected for during agricultural propagation. Sweet oranges have a distinct origin from the bitter orange, which arose independently, perhaps in the wild, from a cross between pure mandarin and pomelo parents. The earliest mention of the sweet orange in Chinese literature dates from 314 B.C. In Europe, the Moors introduced the orange to Spain which was known as Al-Andalus, modern Andalusia, with large scale cultivation starting in the 10th century as evidenced by complex irrigation techniques specifically adapted to support orange orchards. Citrus fruits — among them the bitter orange — were introduced to Sicily in the 9th century during the period of the Emirate of Sicily, but the sweet orange was unknown until the late 15th century or the beginnings of the 16th century, when Italian and Portuguese merchants brought orange trees into the Mediterranean area. Shortly afterward, the sweet orange quickly was adopted as an edible fruit. It also was considered a luxury item and wealthy people grew oranges in private conservatories, called orangeries. By 1646, the sweet orange was well known throughout Europe. Louis XIV of France had a great love of orange trees, and built the grandest of all royal Orangeries at the Palace of Versailles. At Versailles potted orange trees in solid silver tubs were placed throughout the rooms of the palace, while the Orangerie allowed year-round cultivation of the fruit to supply the court. When Louis condemned his finance minister, Nicolas Fouquet, in 1664, part of the treasures which he confiscated were over 1,000 orange trees from Fouquet's estate at Vaux-le-Vicomte. Spanish travelers introduced the sweet orange into the American continent. On his second voyage in 1493, Christopher Columbus may have planted the fruit in Hispaniola. Subsequent expeditions in the mid-1500s brought sweet oranges to South America and Mexico, and to Florida in 1565, when Pedro Menéndez de Avilés founded St Augustine. Spanish missionaries brought orange trees to Arizona between 1707 and 1710, while the Franciscans did the same in San Diego, California, in 1769. An orchard was planted at the San Gabriel Mission around 1804 and a commercial orchard was established in 1841 near present-day Los Angeles. In Louisiana, oranges were probably introduced by French explorers. Archibald Menzies, the botanist and naturalist on the Vancouver Expedition, collected orange seeds in South Africa, raised the seedlings onboard and gave them to several Hawaiian chiefs in 1792. Eventually, the sweet orange was grown in wide areas of the Hawaiian Islands, but its cultivation stopped after the arrival of the Mediterranean fruit fly in the early 1900s. As oranges are rich in vitamin C and do not spoil easily, during the Age of Discovery, Portuguese, Spanish, and Dutch sailors planted citrus trees along trade routes to prevent scurvy. The Valencia orange is a late-season fruit, and therefore a popular variety when navel oranges are out of season. This is why an anthropomorphic orange was chosen as the mascot for the 1982 FIFA World Cup, held in Spain. The mascot was named Naranjito ("little orange") and wore the colors of the Spanish national football team. Thomas Rivers, an English nurseryman, imported this variety from the Azores Islands and catalogued it in 1865 under the name Excelsior. Around 1870, he provided trees to S. B. Parsons, a Long Island nurseryman, who in turn sold them to E. H. Hart of Federal Point, Florida. Trees from groves in hammocks or areas covered with pine forest are budded on sour orange trees, a method that gives a high solids content. On sand, they are grafted on rough lemon rootstock. The Hamlin orange is one of the most popular juice oranges in Florida and replaces the Parson Brown variety as the principal early-season juice orange. This cultivar is now[needs update] the leading early orange in Florida and, possibly, in the rest of the world. Jaffa orange: grown in the Middle East, also known as "Shamouti"
According to a 1917 study by Palemon Dorsett, Archibald Dixon Shamel and Wilson Popenoe of the United States Department of Agriculture (USDA), a single mutation in a Selecta orange tree planted on the grounds of a monastery near Bahia, Brazil, probably yielded the first navel orange between 1810 and 1820. Nevertheless, a researcher at the University of California, Riverside, has suggested that the parent variety was more likely the Portuguese navel orange (Umbigo), described by Antoine Risso and Pierre Antoine Poiteau in their book Histoire naturelle des orangers ("Natural History of Orange Trees", 1818–1822). The mutation caused the orange to develop a second fruit at its base, opposite the stem, embedded within the peel of the primary orange. Navel oranges were introduced in Australia in 1824 and in Florida in 1835. In 1870, twelve cuttings of the original tree were transplanted to Riverside, California, where the fruit became known as "Washington". This cultivar was very successful, and rapidly spread to other countries. Because the mutation left the fruit seedless and, therefore, sterile, the only method to cultivate navel oranges was to graft cuttings onto other varieties of citrus trees. The California Citrus State Historic Park and the Orcutt Ranch Horticulture Center preserve the history of navel oranges in Riverside. Today, navel oranges continue to be propagated through cutting and grafting. This does not allow for the usual selective breeding methodologies, and so all navel oranges can be considered fruits from that single, nearly two-hundred-year-old tree: they have exactly the same genetic make-up as the original tree and are, therefore, clones. This case is similar to that of the common yellow seedless banana, the Cavendish, or that of the Granny Smith apple. On rare occasions, however, further mutations can lead to new varieties. Cara cara oranges (also called "red navel") are a type of navel orange grown mainly in Venezuela, South Africa and in California's San Joaquin Valley. They are sweet and comparatively low in acid, with a bright orange rind similar to that of other navels, but their flesh is distinctively pinkish red. It is believed that they have originated as a cross between the Washington navel and the Brazilian Bahia navel, and they were discovered at the Hacienda Cara Cara in Valencia, Venezuela, in 1976. Blood oranges are a natural mutation of C. sinensis, although today the majority of them are hybrids. High concentrations of anthocyanin give the rind, flesh, and juice of the fruit their characteristic dark red color. Blood oranges were first discovered and cultivated in Sicily in the fifteenth century. Since then they have spread worldwide, but are grown especially in Spain and Italy under the names of sanguina and sanguinella, respectively. Sanguinelli: a mutant of the Doble Fina, discovered in 1929 in Almenara, in the Castellón province of Spain. It is cultivated in Sicily. The taste of oranges is determined mainly by the relative ratios of sugars and acids, whereas orange aroma derives from volatile organic compounds, including alcohols, aldehydes, ketones, terpenes, and esters. Bitter limonoid compounds, such as limonin, decrease gradually during development, whereas volatile aroma compounds tend to peak in mid– to late–season development. Taste quality tends to improve later in harvests when there is a higher sugar/acid ratio with less bitterness. As a citrus fruit, the orange is acidic, with pH levels ranging from 2.9 to 4.0. As with other citrus fruits, orange pulp is an excellent source of vitamin C, providing 64% of the Daily Value in a 100 g serving (right table). Numerous other essential nutrients are present in low amounts (right table). Oranges contain diverse phytochemicals, including carotenoids (beta-carotene, lutein and beta-cryptoxanthin), flavonoids (e.g. naringenin) and numerous volatile organic compounds producing orange aroma, including aldehydes, esters, terpenes, alcohols, and ketones. Orange juice contains only about one-fifth the citric acid of lime or lemon juice (which contain about 47 g/l). The United States Department of Agriculture (USDA) has established the following grades for Florida oranges, which primarily apply to oranges sold as fresh fruit: US Fancy, US No. 1 Bright, US No. 1, US No. 1 Golden, US No. 1 Bronze, US No. 1 Russet, US No. 2 Bright, US No. 2, US No. 2 Russet, and US No. 3. The general characteristics graded are color (both hue and uniformity), firmness, maturity, varietal characteristics, texture, and shape. Fancy, the highest grade, requires the highest grade of color and an absence of blemishes, while the terms Bright, Golden, Bronze, and Russet concern solely discoloration. As oranges are sensitive to frost, there are different methods to prevent frost damage to crops and trees when subfreezing temperatures are expected. A common process is to spray the trees with water so as to cover them with a thin layer of ice that will stay just at the freezing point, insulating them even if air temperatures drop far lower. This is because water continues to lose heat as long as the environment is colder than it is, and so the water turning to ice in the environment cannot damage the trees. This practice, however, offers protection only for a very short time. Another procedure is burning fuel oil in smudge pots put between the trees. These devices burn with a great deal of particulate emission, so condensation of water vapour on the particulate soot prevents condensation on plants and raises the air temperature very slightly. Smudge pots were developed for the first time after a disastrous freeze in Southern California in January 1913 destroyed a whole crop. The first major pest that attacked orange trees in the United States was the cottony cushion scale (Icerya purchasi), imported from Australia to California in 1868. Within 20 years, it wiped out the citrus orchards around Los Angeles, and limited orange growth throughout California. In 1888, the USDA sent Alfred Koebele to Australia to study this scale insect in its native habitat. He brought back with him specimens of Novius cardinalis, an Australian ladybird beetle, and within a decade the pest was controlled. The citrus greening disease, caused by the bacterium Liberobacter asiaticum, has been the most serious threat to orange production since 2010. It is characterized by streaks of different shades on the leaves, and deformed, poorly colored, unsavory fruit. In areas where the disease is endemic, citrus trees live for only five to eight years and never bear fruit suitable for consumption. In the western hemisphere, the disease was discovered in Florida in 1998, where it has attacked nearly all the trees ever since. It was reported in Brazil by Fundecitrus Brasil in 2004. As from 2009, 0.87% of the trees in Brazil's main orange growing areas (São Paulo and Minas Gerais) showed symptoms of greening, an increase of 49% over 2008. The disease is spread primarily by two species of psyllid insects. One of them is the Asian citrus psyllid (Diaphorina citri Kuwayama), an efficient vector of the Liberobacter asiaticum. Generalist predators such as the ladybird beetles Curinus coeruleus, Olla v-nigrum, Harmonia axyridis, and Cycloneda sanguinea, and the lacewings Ceraeochrysa spp. and Chrysoperla spp. make significant contribution to the mortality of the Asian citrus psyllid, which results in 80–100% reduction in psyllid populations. In contrast, parasitism by Tamarixia radiata, a species-specific parasitoid of the Asian citrus psyllid, is variable and generally low in southwest Florida: in 2006, it amounted to a reduction of less than 12% from May to September and 50% in November. Greasy spot, a fungal disease caused by the Mycosphaerella citri, produces leaf spots and premature defoliation, thus reducing the tree's vigour and yield. Ascospores of M. citri are generated in pseudothecia in decomposing fallen leaves. Once mature, ascospores are ejected and subsequently dispersed by air currents. Brazil is the world's leading orange producer, with an output of 17 million tonnes, followed by China, India, and the United States as the four major producers. As almost 99% of the fruit is processed for export, 53% of total global frozen concentrated orange juice production comes from this area and the western part of the state of Minas Gerais. In Brazil, the four predominant orange varieties used for obtaining juice are Hamlin, Pera Rio, Natal, and Valencia. In the United States, groves are located mainly in Florida, California, and Texas. The majority of California's crop is sold as fresh fruit, whereas Florida's oranges are destined to juice products. The Indian River area of Florida is known for the high quality of its juice, which often is sold fresh in the United States and frequently blended with juice produced in other regions because Indian River trees yield very sweet oranges, but in relatively small quantities. Although not as juicy or tasty as the flesh, orange peel is edible and has significant contents of vitamin C, dietary fiber, total polyphenols, carotenoids, limonene and dietary minerals, such as potassium and magnesium. Orange juice is obtained by squeezing the fruit on a special tool (a juicer or squeezer) and collecting the juice in a tray underneath. This can be made at home or, on a much larger scale, industrially. Brazil is the largest producer of orange juice in the world, followed by the United States, where it is one of the commodities traded on the New York Board of Trade. Sweet orange oil is a by-product of the juice industry produced by pressing the peel. It is used for flavoring food and drinks and also in the perfume industry and aromatherapy for its fragrance. Sweet orange oil consists of approximately 90% D-limonene, a solvent used in various household chemicals, such as wood conditioners for furniture and—along with other citrus oils—detergents and hand cleansers. It is an efficient cleaning agent with a pleasant smell, promoted for being environmentally friendly and therefore, preferable to petrochemicals. D-limonene is, however, classified as irritating to the skin and as very toxic to aquatic life in different countries. Marmalade preserves are traditionally made with Seville oranges, which are less sweet. All parts of the fruit are used: the pith and pips (separated and placed in a muslin bag) are boiled in a mixture of juice, slivered peel, sliced-up flesh, sugar, and water to extract their pectin, which helps the conserve to set. ^ "Citrus ×sinensis (L.) Osbeck (pro sp.) (maxima × reticulata) sweet orange". Plants.USDA.gov. Archived from the original on May 12, 2011. ^ "Orange Fruit Information". 9 June 2017. Retrieved 20 September 2018. ^ "Orange fruit nutrition facts and health benefits". Retrieved 20 September 2018. ^ "Oranges: Health Benefits, Risks & Nutrition Facts". Retrieved 20 September 2018. ^ Andrés García Lor (2013). Organización de la diversidad genética de los cítricos (PDF) (Thesis). p. 79. ^ a b c d e f g h i Morton, J (1987). "Orange, Citrus sinensis. In: Fruits of Warm Climates". NewCROP, New Crop Resource Online Program, Center for New Crops & Plant Products, Purdue University. pp. 134–142. ^ "Citrus sinensis". Germplasm Resources Information Network (GRIN). Agricultural Research Service (ARS), United States Department of Agriculture (USDA). Retrieved 10 December 2017. ^ a b c "Top Production of Oranges, 2014 – choose "Production, Crops, World" in the left margin and picklist". United Nations, Food and Agricultural Organization, FAO Statistics. 2014. Retrieved 1 April 2017. ^ "Seed and Fruits". esu.edu. Archived from the original on 2010-11-14. ^ a b c d Willard Hodgson (1967–1989) . "4". In Webber, Herbert John; rev Walter Reuther and Harry W. Lawton. The Citrus Industry, Horticultural Varieties of Citrus. Riverside, California: University of California Division of Agricultural Sciences. Archived from the original on 2012-02-05. ^ "Sweet Orange – Citrus sinensis (L.) Osbeck (pro. sp.) – Overview – Encyclopedia of Life". Encyclopedia of Life. ^ "Pith dictionary definition – pith defined". www.yourdictionary.com. ^ "Pip dictionary definition – pip defined". www.yourdictionary.com. ^ Webber, Herbert John; Reuther, Walter & Lawton, Harry W. (1967–1989) . "The Citrus Industry". Riverside, California: University of California Division of Agricultural Sciences. Archived from the original on 2004-06-04. ^ Curk, Franck; Ollitrault, Frédérique; Garcia-Lor, Andres; Luro, François; Navarro, Luis; Ollitrault, Patrick (2016). "Phylogenetic origin of limes and lemons revealed by cytoplasmic and nuclear markers". Annals of Botany. 117 (4): 565–583. doi:10.1093/aob/mcw005. PMC 4817432. PMID 26944784. ^ Gerald Klingaman. "Plant of the Week. Hardy Orange or Trifoliate Orange. Latin: Poncirus trifoliat". University of Arkansas. Division of Agriculture. ^ "Tangerines (mandarin oranges) nutrition facts and health benefits". nutrition-and-you.com. ^ "Definition of SCION". www.merriam-webster.com. ^ a b "Definition of orange". Collins English Dictionary (collinsdictionary.com). ^ "Definition of orange". OED online (www.oxforddictionaries.com). ^ a b "Multilingual Multiscript Plant Name Database: Sorting Citrus Names". University of Melbourne (www.search.unimelb.edu.au). Retrieved 11 December 2012. ^ a b Ostergren, Robert C. & Le Bosse, Mathias (2011). The Europeans, Second Edition: A Geography of People, Culture, and Environment. Guilford Press. p. 129. ISBN 978-1-60918-140-6. ^ Charles Duff (1971). Spanish for beginners. HarperCollins. p. 191. ISBN 978-0-06-463271-3. ^ "What is the meaning of the Slovak word pomaranč?". WordHippo. ^ Hoad, T. F. (1996). "orange". The Concise Oxford Dictionary of English Etymology. HighBeam Research. Retrieved May 19, 2010. ^ a b c G Albert Wu; et al. (2014). "Sequencing of diverse mandarin, pomelo and orange genomes reveals complex history of admixture during citrus domestication". Nature Biotechnology. 32 (7): 656–662. doi:10.1038/nbt.2906. PMC 4113729. PMID 24908277. ^ Trillo San José, Carmen (1 September 2003). "Water and landscape in Granada". Universidad de Granada. ^ Sauls, Julian W. (December 1998). "HOME FRUIT PRODUCTION-ORANGES". The Texas A&M University System. Retrieved 30 November 2012. ^ Mau, Ronald & Kessing, Jayma Martin (April 2007). "Ceratitis capitata (Wiedemann)". Knowledge Master, University of Hawaii. Retrieved 5 December 2012. ^ a b Coit, John Eliot (1915). Citrus fruits: an account of the citrus fruit industry, with special reference to California requirements and practices and similar conditions. The Macmillan Company. Retrieved 2 October 2011. ^ a b Material Identification Sheet. Webcapua.com. Retrieved on 2011-10-02 (in French). ^ Citrus Pages / Sweet oranges. Users.kymp.net. Retrieved on 2011-10-02. ^ "The Life of Lue Gim Gong". West Volusia Historical Society. Archived from the original on 15 November 2012. Retrieved 5 December 2012. ^ "Home". Sunkist. Archived from the original on 2011-01-20. ^ a b c d Staff of the Citrus Experiment Station, College of Natural and Agricultural Sciences (1910–2011). "Sweet Oranges and Their Hybrids". Citrus Variety Collection. University of California (Riverside). Retrieved January 19, 2011. ^ "Commodity Fact Sheet: Citrus Fruits" (PDF). California Foundation for Agriculture in the Classroom. Retrieved 2012-03-06. ^ a b "UBC Botanical Garden, Botany Photo of the Day". Archived from the original on 2010-01-24. ^ a b Susser, Allen (1997). The Great Citrus Book: A Guide with Recipes. Ten Speed Press. ISBN 978-0-89815-855-7. ^ Bai, Jinhe; Baldwin, Elizabeth B; Hearn, Jake; Driggers, Randy; Stover, Ed (2014). "Volatile Profile Comparison of USDA Sweet Orange-like Hybrids versus 'Hamlin' and 'Ambersweet'". HortScience. 49 (10): 1262–1267. doi:10.21273/HORTSCI.49.10.1262. ^ a b Bai, J; Baldwin, E. A.; McCollum, G; Plotto, A; Manthey, J. A.; Widmer, W. W.; Luzio, G; Cameron, R (2016). "Changes in Volatile and Non-Volatile Flavor Chemicals of "Valencia" Orange Juice over the Harvest Seasons". Foods. 5 (1): 4. doi:10.3390/foods5010004. PMC 5224568. PMID 28231099. ^ a b Sinclair, Walton B.; Bartholomew, E.T. & Raamsey, R. C. (1945). "Analysis of the organic acids of orange juice" (PDF). Plant Physiology. 20 (1): 3–18. doi:10.1104/pp.20.1.3. PMC 437693. PMID 16653966. ^ Centers for Disease Control and Prevention (CDC) (July 16, 1999). "Outbreak of Salmonella Serotype Muenchen Infections Associated with Unpasteurized Orange Juice – United States and Canada, June 1999". Morbidity and Mortality Weekly Report. 48 (27): 582–585. PMID 10428096. ^ Penniston KL, Nakada SY, Holmes RP, Assimos DG (2008). "Quantitative Assessment of Citric Acid in Lemon Juice, Lime Juice, and Commercially-Available Fruit Juice Products". Journal of Endourology. 22 (3): 567–570. doi:10.1089/end.2007.0304. PMC 2637791. PMID 18290732. ^ "How Cold Can Water Get?". NEWTON BBS. Argonne National Laboratory. 2002-09-08. Retrieved 2009-04-16. ^ a b Lacey, Kevin (July 2012). "Citrus rootstocks for WA" (PDF). Government of WA. Department of Agriculture and Food. Archived from the original (PDF) on 2013-11-12. Retrieved 30 November 2012. ^ Dr Price, Martin. "Citrus Propagation and Rootstocks". ultimatecitrus.com. Retrieved 30 November 2012. ^ Ehsani, R. et al. (June 2007) "In-situ Measurement of the Actual Detachment Force of Oranges Harvested by a Canopy Shaker Harvesting Machine". Abstracts for the 2007 Joint Annual Meeting of the Florida State Horticulture Society. ^ "Fresh Citrus Direct". freshcitrusdirect.wordpress.com. Archived from the original on 2015-01-10. ^ a b Wagner, Alfred B. & Sauls, Julian W. "Harvesting and Pre-pack Handling". The Texas A&M University System. Retrieved 29 November 2012. ^ Arpaia, Mary Lu & Kader, Adel A. "Orange: Recommendations for Maintaining Postharvest Quality". UCDavis Postharvest Technology Center. ^ a b "Home Storage Guide for Fresh Fruits & Vegetables. Canadian Produce Marketing Association" (PDF). cpma.ca. Archived from the original (PDF) on 2013-05-12. ^ "Frozen Concentrated Orange Juice (FCOJ) Commodity Market – Credit and Finance Risk Analysis". credfinrisk.com. Archived from the original on 17 March 2012. ^ "Oranges: Production Map by State". US Department of Agriculture. 1 March 2017. Retrieved 1 April 2017. ^ "History of the Indian River Citrus District". Indian River Citrus League (ircitrusleague.org). Retrieved 27 November 2012. ^ USDA Foreign Agricultural Service. "USDA – U.S and the World Situation: Citrus" (PDF). Archived from the original (PDF) on June 4, 2012. ^ Townsend, Chet. "The Story of Florida Orange Juice: From the Grove to Your Glass". ^ "D-LIMONENE". International Programme on Chemical Safety. April 2005. Look up orange (fruit) in Wiktionary, the free dictionary. Citrus sinensis List of Chemicals (Dr. Duke's Phytochemical and Ethnobotanical Databases), USDA, Agricultural Research Service. Oranges: Safe Methods to Store, Preserve, and Enjoy. (2006). University of California Agriculture and Natural Resources. Accessed May 23, 2014.